I took some time this weekend to fix a few visual issues with some of the basic room varieties. Shown in these shots are approximately half the basic room tiles. The images below are taken while holding a white color torch with a 30m radius. The area lighting is pitch black, with an amount of black fog. Fixed a little bit of pathing issues. I'm also using partial walkmeshes instead of fleshing out the entire edge. It seems to work without any fuss. As long as every tile has a closure of type 7 or some other non-walk type, the character doesn't fly away to the ceiling. The reason I'm trying partial walkmeshes is that my script for auto walkmeshes, by looking down onto the tile with a raytracer, is unable to see the walls and ceiling. Instead of writing in a bit to stretch the WM polys out to the tile edge and some even longer code to find the appropriate verts, I'm just having it use two of the floor panels. This allows me to build just the floor and the unwalkable setback exactly how I want the walkmesh to be built, and the script will mimic those parts into one for me. If I put down placeable shapes in the tile, it will see them and build a no-walk polygon in their place. I strive to be lazy with my robot army, but I want them to understand my goal is to eventually add in objects like I'm playing with Unity or Unreal. As you may see, some of the textures are still mirrored across tile boundaries, so I will definitely be modifying that texture script for the wall panels to include at least 4 planes. There are also some texture-stretched knobs I don't like, so adding at least two more diagonal planes will fix that. In any case, each plane added makes a little bit more chance to make textures look unsmoothed, like many of the texture in my Granitelands set. I can work with those later to touch up gaps like I'm slowly doing with the Granitelands. In the next few tiles, you can see some of the open tile features, including water and pits. Right now, if you move the camera outside the cave hull, you'll be able to see down into the water as if it is just a greenish rock. I may put a black box around the wells so you can't look into them for monsters without getting to the edge. No peeking! 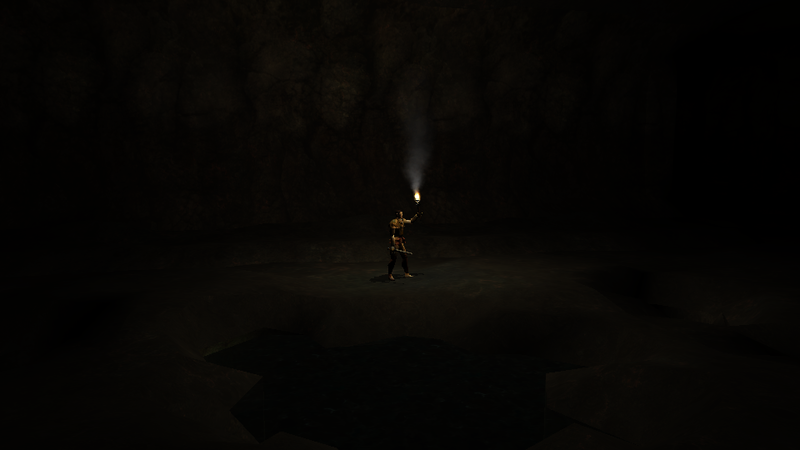 I've modified the water texture from vanilla underdark. 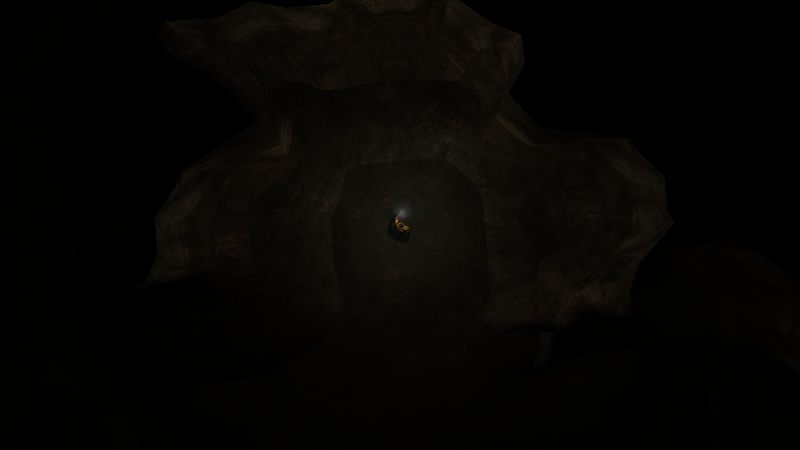 That texture was too bright for this cave appearance and the black fog didn't tone it down enough. The water looked too glowy and sparkly for the atmosphere I was going for. This one is quite black, but you can see into it. I've lightened the textures below so it looks like the mineral in the water is magnifying the light and adding green-blue to the stone. I've got some static placeable buscuits that are intended to represent cave rafts and other crusts that surround water bodies. Not sure how many of these are best for the appearance, but I already know I need to modify the variety I have. If you do a google search for "shadowbound game", the intro scene screenshots have a blue cavern zone with a bunch of these boat buscuits in use. That's what I'm going for with these. You can also google "onondaga cave missouri" to see the real-life rafts and crust around the edge of an underground river. 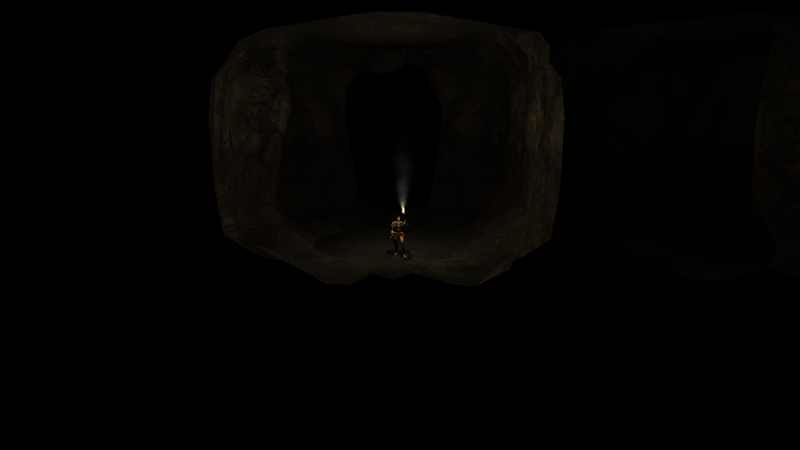 The image below is taken through the cave wall of a diagonal 1x1 room. The variety of diagonals is high enough that it looks like a square room but is at 45 degrees to the normal tile direction. Because the diagonal opening is in the center of a tile, it can be made to accept a door in the future, without crossing mutiple tiles with the door object. This next corner tile has an odd shape where monsters can hide. There are three of these so far. Two of them are the concave corners, and one is this convex corner. I snuck inside it and you could see my torch smoke, and that was it. Watch for morlocks. Below is another diagonal room with a differnet set of corner tiles. this little ledge needs some work. It's height is such that the normal human torch doesn't illuminate it, and the lack of rounded edges doesn't help the main plane to become illuminated by proximity. I'll reduce the height of the plane so that you can see objects on it. I'll also open up the setback so you can walk right up to it and take stuff off the ledge. 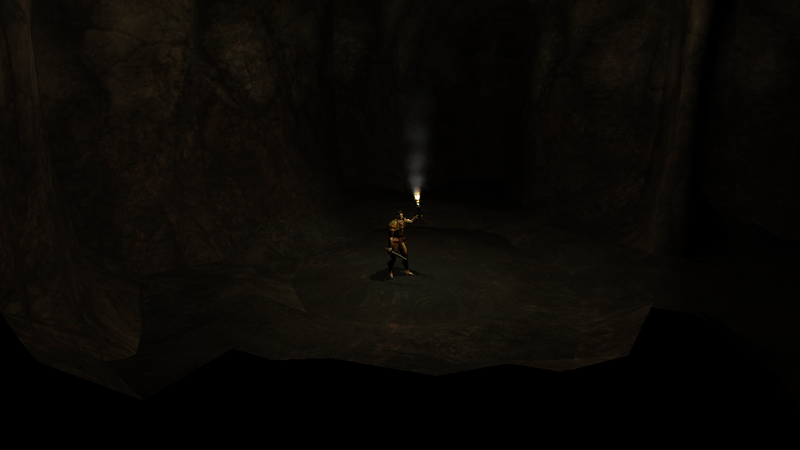 Ledges and boulders in the setback space have walkmeshes that allow items to be placed on them, but do not have a proper height transition on the walkmesh due to the walkmesh building script. Characters with spells that let them jump around can currently jump to the ledge, and then walk into space outside the tile through the wall. The gods will not allow this kind of behavior. OK! So basic rooms are as done as they will get, minus some duplicate tiles with ceiling variety. Nothing a few minutes can't handle for each tile. Next week I will have completely finished, updated, and rebuilt the SET file to include the basic corridors. During that time I should have also finished the basic tiles for basic pit-room-wall mixers, as well as great chasm-room-wall mixers. I may or may not be happy with the two varieties of height transition at this time, and might put another week of touch up into them. With the scripts I'm building for texture placement and correction, these groups should be easy to finish because I'm just basically welding parts together, warping them a little bit, reducing vert count, and then chopping them back into the 4 main parts: floor, wall, setback, and pits. The scripts are doing the rest. So, what are these crazy corridor naming runes? They basically make convoluted mazes. Y rooms have three corridor exits. Two on top and one on the bottom. T rooms have two opposite and one at 90 degrees, so they cover the other two options that Y rooms do not. X rooms have four exits at 90 degrees to each other, but equally spaced around the group. S rooms have two exits on opposite sides, and a zig-zag in the middle part of the group. Z is just the angular variety direction. Both come in left- and right-handed curves. X-S is an S room, but has 4 exits, and a snake in the center. Two exits leave eacy opposite corner. A version of the X-S room has the shape of an hourglass with a tight corridor across the center, which can serve as a difficult combat situation. Another version has a stair down through the hourglass. Bow rooms have two exits opposite each other, and a bow shape in the middle that goes through another two tiles. Rooms like this help break up the blocky tileset feel over long distances. Bow rooms have a lot of real estate that seems wasted, so the goal is to make a large variety of bow groups. Shift rooms have two exits opposite, but offset, and a smooth curve in the middle across two tiles. As with bow rooms, these are just to cut the monotony of tileset feel. Shift rooms have plenty of visual real estate to play with and could be turned into a huge collection of tile groups. The Pocket T connects two corridor exits in a pocket from a room edge. Just another way of doing a T, but from a room rather than a corridor. You have to enter the nook to see the corridor. In the dark, this may be in visible. The Shift-T covers another two options not covered by the Y and T, but is similar to both. It's in the shape of a warped T.
The Shift-Y covers yet another two options, but is similar to both. Two exits leave the same corner tile, the other is on the far side of the room, with a snake in the center. The X-Y room has half the features of an X, and half the features of the Y, and has 4 exits total. A squigle in the center keeps you from viewing the 4th exit without going to it. Good for ambushes and getting people lost. The phi room has 4 exits at diagonals with a strange center that blocks a lot of the view across the center. This could be a fairly dangerous area. The parallel room connects two parallel corridors by a break in the wall. Diademus' spider caves had this group. The corridors also have 11 staircase rooms so far. One is a 3x3 U-shaped room with two height transitions, and a cool column and dripstone thing to look at on the middle tile. I really like that one! I'm aiming for dark, and remember that this is with black fog on purpose. With the fog on, the brightest colors on my screenshots are showing up to 11% maximum luminance. With no fog applied, they register as maximum 26% luminance. Without any shading in GMAX, the brightest color on the wall is at 36% luminance. 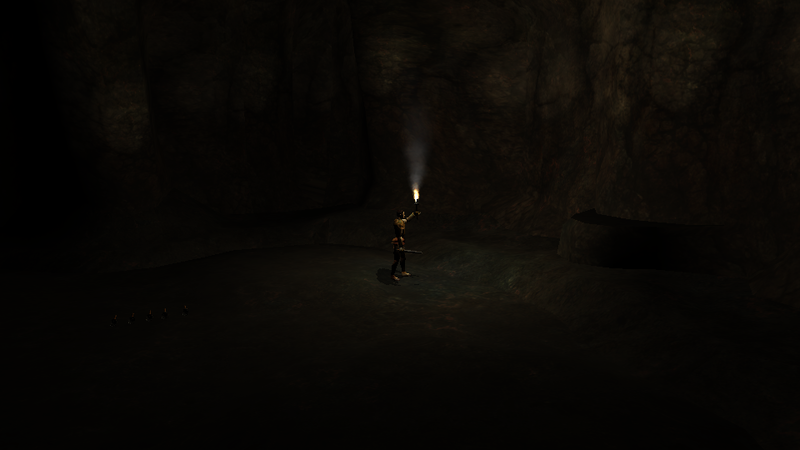 Anything over 50% and I'd think lighting effects in a cave would be fairly pointless because it's going to feel fluorescently lit. 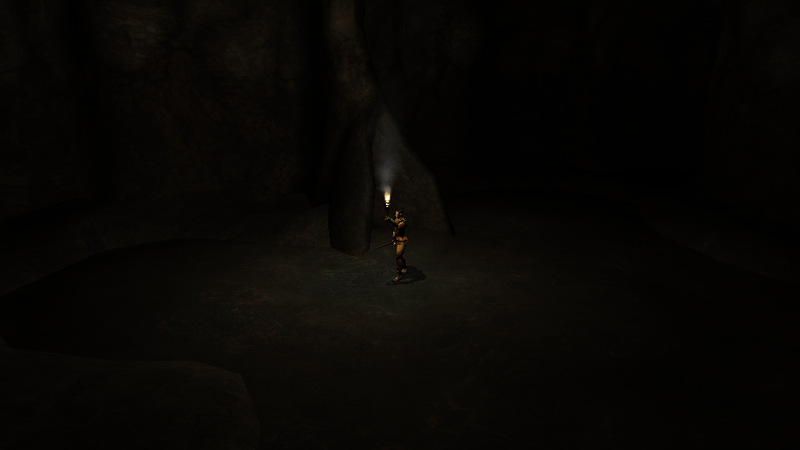 Add in some glowing fungus placeables and tile lighting and I think this will fit the needs of everybody looking for a real cave atmosphere. Keep in mind that units will also have potential glowy things on their person. 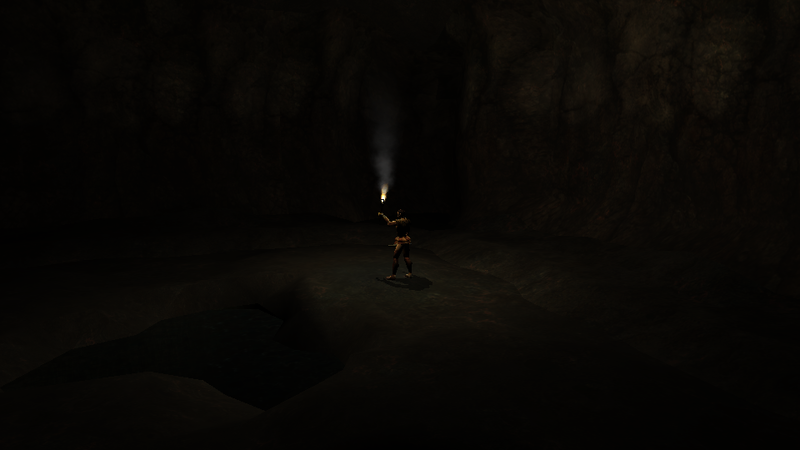 I'm showing the most naked cave system with dampening fog, as one would expect in a real cave tour. With some phosphorescent lichen decals on the walls, this darkness really makes those features pop out, and gives me more opportunity to have wider glowing effects that don't look like a cartoon. It also looks extra dark because this room has high celings and no placeables to reflect the light back to your viewpoint. With placeables, a dark room will appear far more bright. You may also be seeing an artificial darkening because the contrast in the textures has been intentionally reduced. 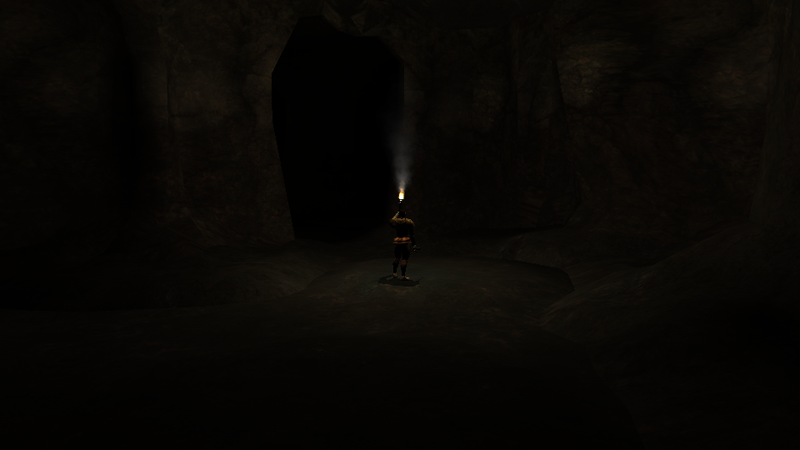 Contrast in the placeables and other cave decoration is going to have a higher contrast, which helps give the appearance of further way and close to you objects. In addition, the speleothem placeables and tile features are lighter in color than the rock behind them. If you think this is dark, wait til you see the deeper underdark versions. You will know you are no longer in Kansas. It's not that a given screenshot is dark, it's that all the screenshots are dark. It's a thread demonstrating new content, brightly lit screenshots make it easier for people to see what the new content looks like in terms of geometry and detail. I hear ya. Let me just say that the geometry is supposed to stay hidden, and that the detail is specifically removed in the background. I know that sounds counterintuitive, but it's what a lot of the designers have been doing since Diablo III came out, and keeps focus on the closer objects. If people want to see the mesh details, maybe I'll post some pics out of GMAX instead with the wireframe turned on. That way they can see how low poly I'm going with the far away stuff, and how high I'm going with the nearby stuff. Maybe I can even list tri-counts in the corner like I did with some of my placeables a few years ago. Dark or not, this is s a super-impressive project you're working on! I cannot wait to see it's release, and also what the community does with such an excellent resource! Impressive progress MD !!! 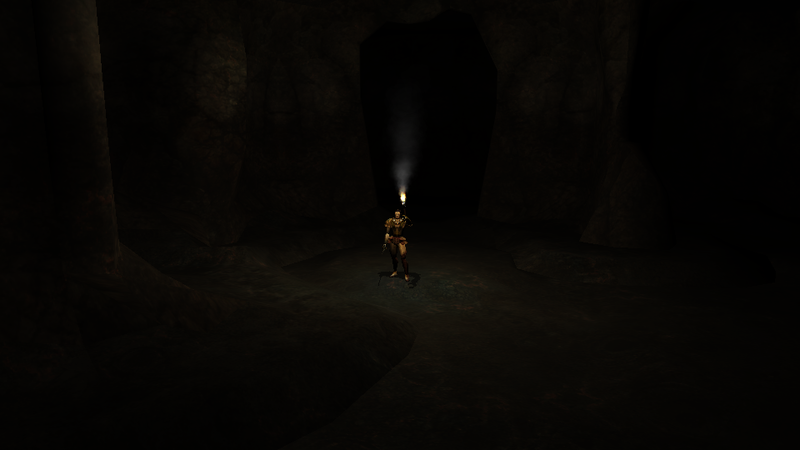 This is powerfully evocative for this old subterranean nut.... And, keep it dark, like you planned (the tileset) but maybe you could lighten snapshots a bit for our surface infravision-lacking friends . Cenotes ! Chasms ! Yay ! Yeah, keep it dark! 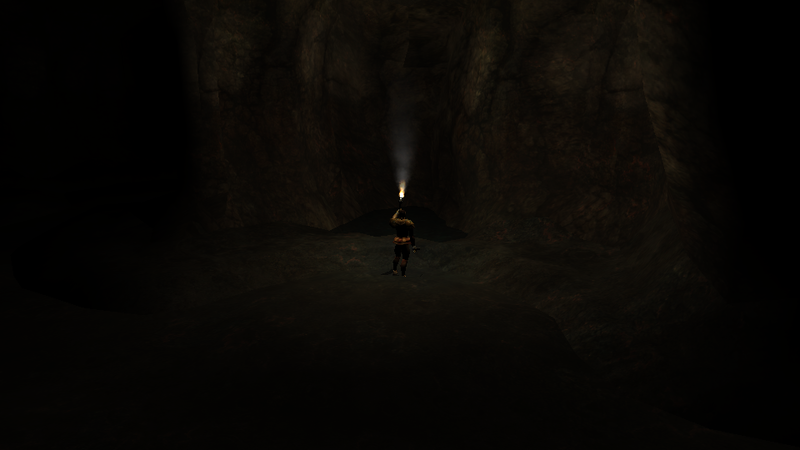 Whenever I do any cave crawling in Northwest Arkansas, it is DARK in there! I mean, pitch black!!! Which is why I want the players to use torches, lanterns, light spells, and so on! And the tilesets are looking really good! You just know there are so many damn monsters around every corner.